People who visit the Phoenix area are sometimes uncertain about what clothing to bring to the desert city. 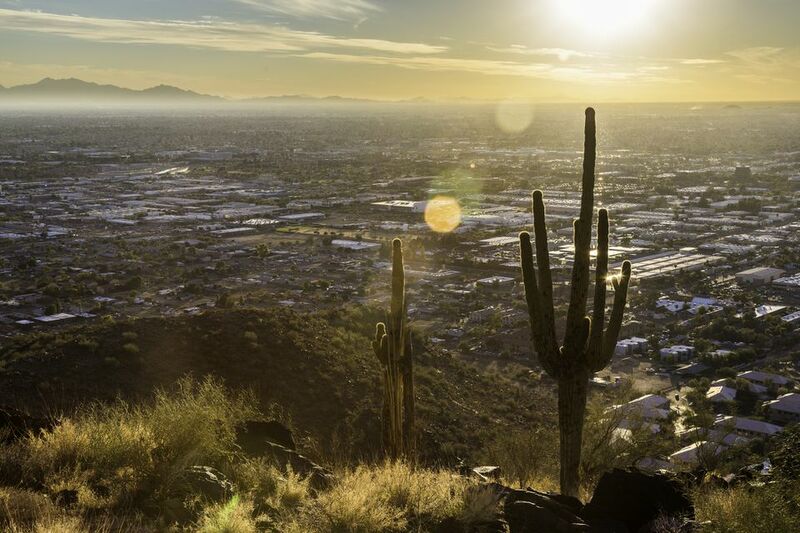 Arizonans can always tell who the out-of-towners are, as they are often the people that don shorts and tank tops when it's 65 degrees in the winter and sunbathe in the sweltering heat of the summer. So you don't look out of place and remain comfortable, these are the best packing tips for your trip. During the winter months, temperatures can fall to 30° F at night, and an overnight frost is common in parts of the Valley of the Sun. During the day, it's not unusual for the high to be around 80° F, so due to the vast differences in temperatures, some layering will be necessary. Also, don't forget that the weather is significantly different just a couple of hours away, so if you plan on taking a day trip to Sedona or somewhere farther north, like the Grand Canyon, bring even more layers along. You probably won't need to bring too many sweaters or corduroy pants, but a base layer of a t-shirt or tank top, with a light jacket on top, and long pants with socks and closed toe shoes should be sufficient for daytime, while you may want to bring a heavier coat for chilly evenings, or plan on doing outdoor activities. While in bigger cities on the east coast or in more 'business-oriented' west coast cities like San Francisco, black is the uniform of choice, it's not the best option for Phoenix weather. Not only will you most likely overheat during the day (even in winter), but you will look out of place if you are wearing this color from head to toe. Stick with brighter neutrals to look more like a local. The general rule of summer dressing is to wear loose-fitting clothing that is breathable. Natural fabrics like cotton and linen are great options, as well as merino wool. This may come as a surprise to most people, but a light wool shirt wicks away sweat and is antimicrobial, making it a perfect fabric for hot summers. You can find wool t-shirts at most outdoor or recreational equipment stores. Most locals wear shorts with t-shirts or tank tops with sandals for casual occasions, with flip flops around the house, running errands, or relaxing by the pool. Sneakers are most often worn when flip flops or sandals aren't appropriate (such as hiking). Sunburn, especially in the summertime is a reality, and a moisturizer with sunscreen recommended, especially if you aren't used to a dry climate. You should also consider wearing a hat or baseball cap for an added layer of protection from the sun. Sunglasses are also a must, for both you and your kids. If you are traveling for business, some companies have special summer wardrobe exceptions, but it's important to check before your arrival. Often, companies will allow women to eschew tights for the summer and encourage pants to be worn during this time, but cropped pants or capris are often not permitted. Sandals are usually permitted, but men often are not permitted to wear them or opt not to. Companies also often invoke a no necktie policy for men, and sometimes allow golf shirts in the summer, even though the dress code might otherwise call for suits. Some of Arizona's public safety personnel such as the police force and fire department are administered shorts in the summer months, so many companies follow suit and adopt a more casual dress policy as well. Even in the most conservative offices, casual Fridays, where jeans are permitted, are fairly common. There are very few restaurants in the area that will turn people away due to their attire. Shorts, tee shirts, and flip-flops are often seen at casual restaurants, but upscale restaurants may request "resort casual" wear. For women, that might mean a sundress, pants, or capris with a nice top and sandals or high heels. For men, you may want to wear jeans or dress pants with a collared shirt or a nice polo shirt and closed toe shoes. Nice (not torn) shorts and a golf shirt will suffice if you are dining on a golf property. Some restaurants might turn you away if you are wearing a baseball cap, a tank top, sneakers, or clothing with vulgar writing. To make sure you avoid a fashion faux pas, you may call the restaurant first.